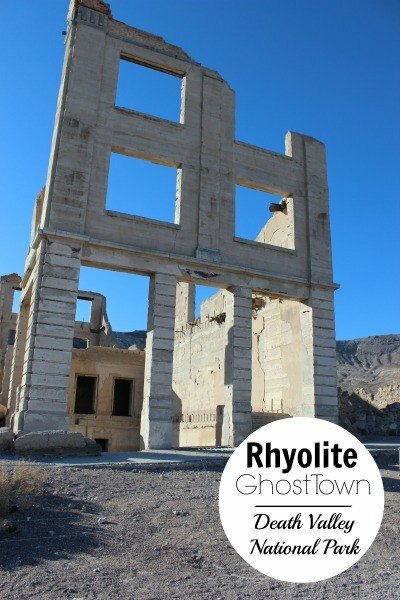 Rhyolite in Death Valley is the largest ghost town in the national park. Since one of the items on my bucket list was to see a true ghost town on our cross-country road trip, naturally I wanted to see the largest. But after driving for what seemed like hours through Death Valley, my husband was anticipating the return of civilization and my kids, who were bemoaning the lack of internet, were eager to reach Las Vegas before nightfall. To keep the peace, I consented to shorten our drive and head out of the park. 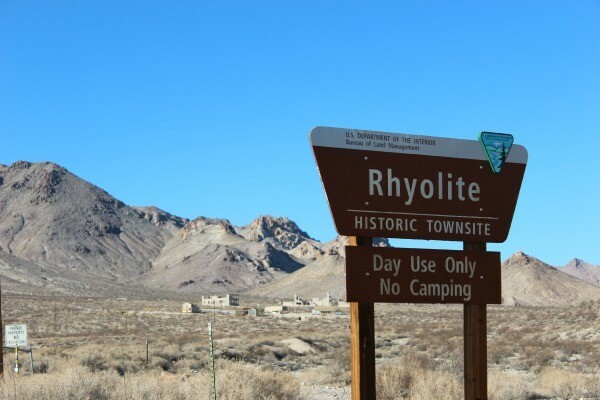 So I was surprised to see a sign for Rhyolite signaling the turn off for the ghost town. My husband decided we could spare a few moments and began to follow the signs. Within minutes we had arrived at the bottle house roadside attraction on the outskirts of the decrepit historic townsite. 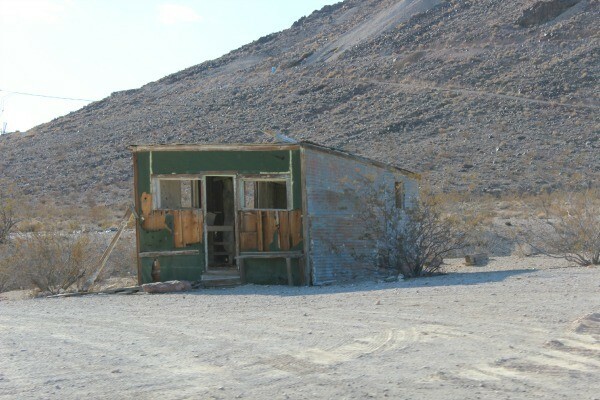 We quickly drove through the Rhyolite ghost town, stopped for a quick restroom break at the provided bathrooms and hopped back inside our vehicle. 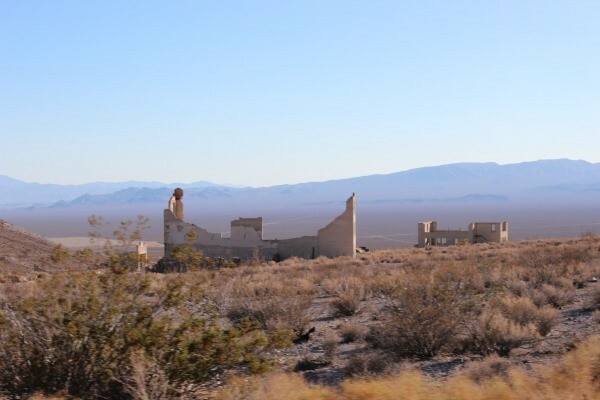 As I gazed across the barren landscape it was hard for me to comprehend that Rhyolite Ghost Town had been one of the largest cities in Nevada in the early 1900’s. The town grew with the promise of gold but began to decline quickly with a financial crisis in 1907. It didn’t take us long to drive through and even though there were many places I was tempted to step out of the vehicle to explore further, many of the buildings are surrounded by barbed wire, a fence, signs, or both, warning visitors of rattlesnakes. The threat of even catching a glimpse of a rattler was enough to keep me firmly in the vehicle, which made my family very happy. 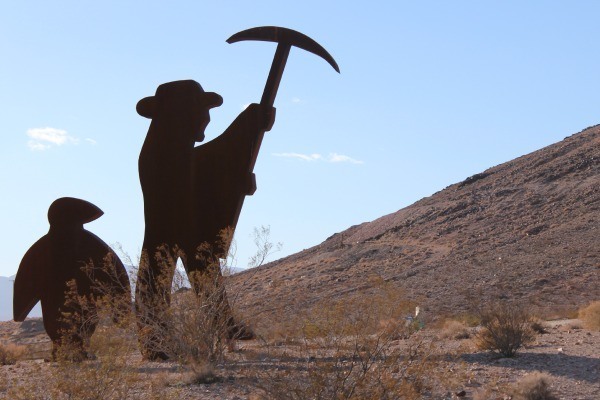 My love of roadside attractions made me want to explore the Goldwell Open Air Museum but my husband insisted I “photograph what I could” as we drove by. 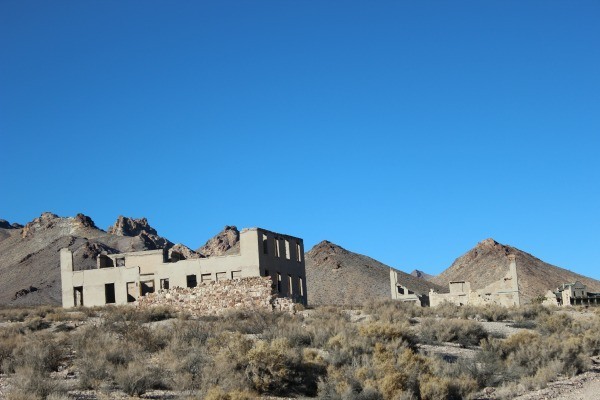 Have you explored Rhyolite Ghost Town in Death Valley National Park? 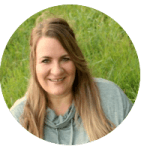 © 2014 – 2017, Tonya Prater. All rights reserved. It looks fascinating but I’m afraid that I would be photographing from my car window – the thought of seeing a rattlesnake terrifies me!! I’m glad that I’m not the only one with that fear! They actually have nice bathrooms right on the edge of the ghost town and we stopped because we’d been driving for hours, but my wimpy self was so worried that a snake would be in the bathroom, I barely remembered why I was there! Death Valley is one of the most amazing (and varied) places on earth. I’ve stayed there twice after flying into Las Vegas and renting a car. I wasn’t expecting Death Valley to be as beautiful as it was. The name just does not conjure positive images. I’d love to return and visit some of the other ghost towns in the park. I love the landscape. It’s hard to imagine that this was a bustling town less than a hundred years ago. We drove cross country this past summer and that would have been neat to see. We went through NM, AZ, NV, and CA and couldn’t believe how desolate it was. We were also ready to get back to civilization. It was a very boring drive through many parts. We are doing it again this summer and I will have to look it up this time and maybe stop and check it out. Mary, we also drove through NM, AZ, NV and CA. 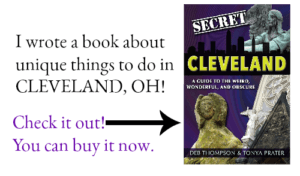 Did you see my road trip posts? It may give you some ideas for your upcoming trip. I’d love to take another trip out west. Next time around, we’ll go through the northern states and down the Pacific NW into California so we can see the Redwoods. We were bummed to miss them this time around. Tonya, thanks so much for sharing on Inspire Me Wednesday. Featuring you in next week’s issue. It’s hard to imagine living out in a “wasteland” where water was at a premium and snakes were not. I would have packed up too if I hadn’t struck golf in the first few days. Stark and forlorn are the two words that immediately come to mind. Hard to believe it was once a thriving city. The thought of snakes creeps me out! What an amazing place. I would like to go there one day. Oh, we have been so close to Death Valley and this makes me regret even more, not visiting! Next time, is my mantra. Great photos!!! Looks like a very interesting, but quite a spooky place. Rattle snakes would have given me the heebie-jeebies though! You and I should take a road trip together, and we’ll stop wherever we like to explore for as long as we want. This does look like and interesting ghost town, but the threat of rattlers would have also kept me in the car. Wow, somehow we have missed this on multiple visits to Death Valley. I just sent the article to my husband and told him that this is on the list for our next trip. I would love to visit a ghost town. This is so cool. I love to look at places like this, to see what happens when you just let things go, but also to see the history and somewhat of what life was like for these people so long ago. I’d be begging to explore too, but the rattlers would keep me back inside as well! That is just a really eerie place! I think when it comes to traveling and fun, quirky stops, I’m definitely more curious than my kids. They’re happy viewing it from afar where I just want to hop out of the car with my feet on the ground and savor the moment. I would be scared. I hate wide open eerie places but I cant seem to say no to them. Its like history and horror meet and I am hooked. It would probably be a bit eerier near dusk- or if there were no other people in site but there was actually another car or two that drove by while we were there. Wow!! That is really desolate! Neat pics! I grew up in the Rancho Cucamonga area in So Cal and have been to Rhyolite several times. It’s like the place time forgot . . . except for the snakes and scorpions. Those things never forget that place! Smart idea, staying in the car! Snakes and scorpions notwithstanding, it’s still a really cool place to visit. Now I wish we would have taken the time to explore some of the other ghost towns but at least we saw one. Scorpions. Ugghh..I forgot about those. Thankfully we didn’t spot any of those on our trip either. How very cool. I would be terrified of rattlesnakes! What a neat place to drive through, though the threat of snakes would definitely keep me in the car too, lol. Oh goodness, rattlesnakes. That’d be enough to keep me in the car too. I love the photo of the sign with the ghost town in the background. So eerily mysterious. That’s one of my favorites. The town was a bit eerie. I think partly because I’m not used to silence. What an unfamiliar thought. 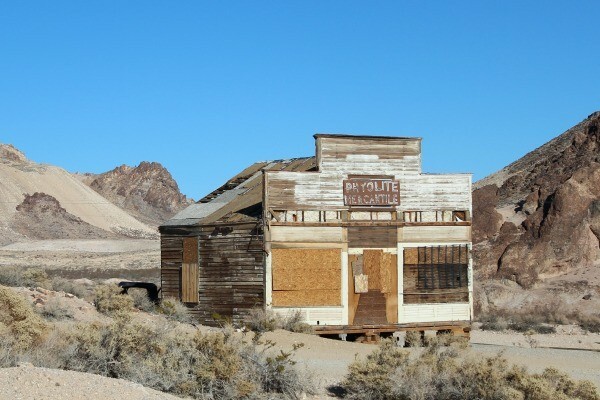 I’ve only ever seen Death Valley on tv… that ghost town looks surprisingly nice and not at all eery like I’d imagine. I was surprised by how stunningly beautiful parts of Death Valley were. I guess I just expected something bland and dull and that’s not what we found. Wow! I bet it seemed a little eerie too. I’ll have to add this to my travel radar! If you’re ever in the vicinity, it would be well worth a stop. I’ve never been to Death Valley before. I would definitely stop here. Looks fascinating! When we lived north of LA, we passed by Death Valley on every trip to Vegas (and yes, there were a lot of those!) but we never stopped to check it out. Now that we’re in Iowa, I look forward to making a trip back that direction to do all the things we missed. Why do we always pass up those places that are “near home”? When my husband worked in Virginia Beach, we would travel back and forth and go directly past DC several times a month. I always thought I’d take the time to stop and we never did. Now that we’re settled back in Ohio, I keep thinking that I need to take another trip to the Capital. 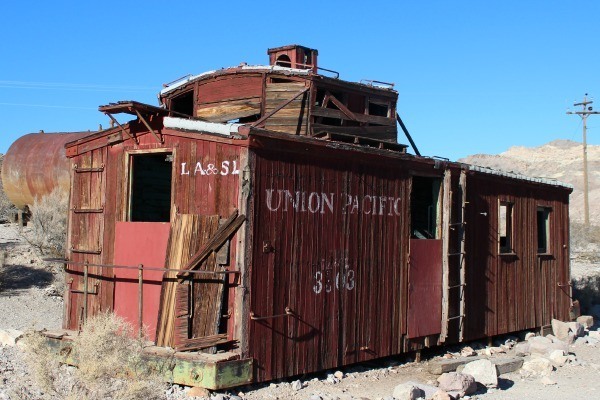 It’s definitely worth the stop and if you enjoy visiting ghost towns, you’ll find that the national park has several. Nope. Couldn’t do it. I would be scared to death driving through there lol. I’ll have to ask my parents if they know of this place. I was born in Reno, but moved away when I was 1. I want to go on a road trip with you, sans kids. I have yet to go to “road side tourist attractions”, but my want combined with your love of them would be an awesome trip! That ghost town is eery! Wow, that’s really neat. I’ve never been that far west but it’s definitely something I’d like to see. It was definitely worth a little bit of a detour. But then, I love things like this so maybe I’m prejudiced.